My eyes tend to wander around my home office a lot when I'm working at my desk. What do I see to my left? My sweet cat. What do I see to my right? A copy of Crenshaw. What do I see if I look directly in front of me? Flora Belle Buckman, Beekle, Babymouse, The Marvels, and Full Cicada Moon. What's that? You want to learn about Cicada Moon? Well, it's your lucky day! Author Marilyn Hilton dropped by to chat with me about Cicada Moon, school libraries, reading, and tap dancing. I wrote the words in orange, and she wrote the words in black. Thank you, Marilyn! Mimi Yoshiko Oliver thinks everyone is created equal, and no one should have to fight for equal justice, equal respect, or equal protection. And it’s a person’s responsibility to speak up when those rights are given to some people but not everyone. She also thinks Vermont is a beautiful state, especially in the fall. And she still thinks cooties are kinda stupid. I hope Full Cicada Moon will help readers see themselves or someone they know in Mimi—as she strives to fit in, to be taken seriously, and to be appreciated for her uniqueness; in her perspective of life, her belief in justice for everyone, her resilience to changes and disappointments, her respect for others and herself, her love for her family and friends, her perseverance in spite of opposition, her courage to speak up and speak out instead of keeping quiet; for her interest in things other people may laugh at, and her faith in taking one small step—even when it’s really scary—toward reaching her goals. And then I hope readers will use these awesome qualities of theirs whenever they face similar challenges. In 1969 the United States was looking back at a decade of tremendous cultural, social, and political change and looking forward to one of the most momentous events in all history. On July 20, 1969, I watched the first moon walk on TV. It was late at night, but my parents let me stay up to witness that historical event. I watched the moon’s surface slide by as the Eagle lunar module skimmed the surface to find the right landing spot. I watched Neil Armstrong step off the ladder of the Eagle, onto the moon’s surface (we all held our breaths), and heard him say, “That’s one small step for man, one giant leap for mankind.” The next day I grabbed our copy of The Boston Globe newspaper and kept it in a drawer for many years. (I think it’s still tucked away in a box in my garage.) Then, twenty five years later, my first baby was born. July 20 is a very special date for me! Full Cicada Moon’s dust jacket made me gasp when I first saw it. 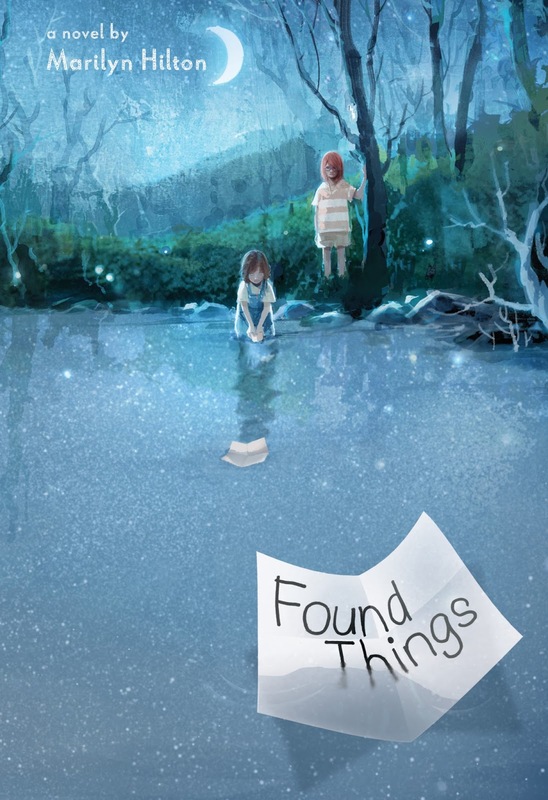 The cover art perfectly captures the essence of this story. 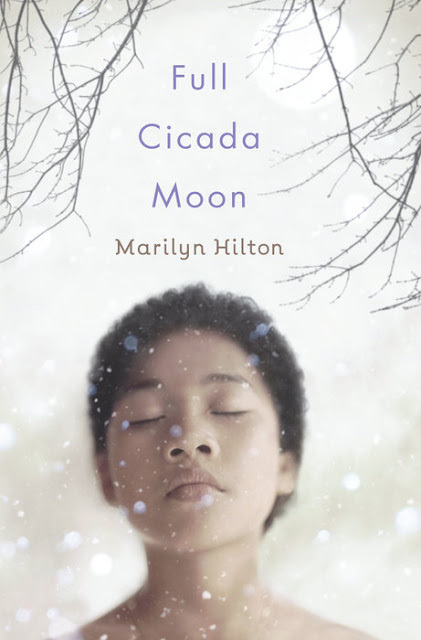 The exquisite “Mimi” with the full moon behind her, falling snow around her, and bare winter branches above her—which reminded me of Japanese sumi-e (black ink painting)—all made me happy, and excited to realize that Full Cicada Moon was actually going to be a book! School libraries are magical places filled with hundreds of new worlds to explore just by reading. School libraries smell lovely—they smell like books! The people who work in school libraries love books, love stories, love reading, and love students. And they love connecting students with the perfect books for them to read. School libraries are also places where students find a place to do their homework after school, research information for their projects, make new friends and grow the friendships they already have, and find acceptance for their quirky and cool interests. Schools need to give their libraries higher priority when evaluating their budgets—because look at all the amazing things that happen in school libraries! Reading is one of my favorite things to do. I have so many books but not enough shelves for them all. (After 23 years of marriage, my poor husband has finally accepted my addiction to books.) But I share the ones I’ve read by giving them to public and school libraries, and by lending them to friends who also love to read. It feels good to introduce other people to great books and wonderful authors. Mr. Schu, you should have asked me if I like to tap dance. I would have said I LOVE TO TAP DANCE! It’s so much fun, it’s great exercise and gives you confidence to try other new things, and you get to wear fun costumes at your recitals! Borrow Full Cicada Moon from your school or public library. Whenever possible, please support independent bookshops.